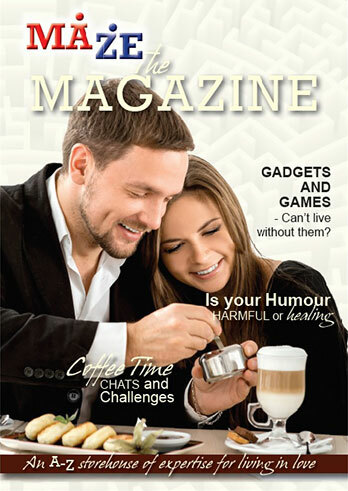 The Magazine is a convenient resource that gives couples a formula for pursuing togetherness and developing intimacy. The Magazine is presented in a workshop style format that is regular, interactive, private, non-threatening, inexpensive and easily accessible in the comfort of your own home. It provides themed interactions which can be undertaken on a weekly basis throughout the course of a whole year. We recommend the purchase of one copy per person as these are interactive workbooks for you to write in. This great resource is an A4 interactive 140 page paperback workbook packed full of glossy images, inspiring messages, humorous cartoons, thought provoking meditations and challenging missions. As there are 26 letters in the alphabet and 52 weeks in a year, it is set up to run as an A-Z with two activities for each letter. So for less than the price of one counselling session, you have a year’s worth of inspiring help for your relationship, without even leaving the sofa! In addition to its more common meaning today, the term MAGAZINE originally meant ‘a store’ and is often used when referring to a military stash of arms or ammunition. We hope THE MAGAZINE will become a storehouse of wisdom and a treasury of opportunities for you to draw from that will help you to mature in loving one another. We recommend that you take an hour or so each week in a place, and at a time, that works for both of you. Try to make it a stress free, technology free zone, enhanced by coffee and cake, or whatever favourite treats you enjoy, so that you will look forward to it eagerly and not allow it to get sidelined. If you make a strong commitment to one another to prioritise these times together you will be able to pursue your goals consistently, deliberately and systematically and you will see the impossible begin to happen! Buy two or more copies and get a 25% discount. If more than 10 copies are required, please contact us.